New York State is to be applauded for implementing the Excelsior Program to make attendance at a SUNY school affordable for working-class families. But because Excelsior does not cover room, board, and books, and because students must maintain a full course load, the plan is hardly perfect for the state’s most disadvantaged populations. Given the state’s history and its historical relations with its Native American populations, New York should provide funding to cover all the costs associated with attending a SUNY school for Native American Students. Colleges and campuses around the country have begun to explore more critically their complicity in the injustices of the American past. Georgetown, for instance, is wrestling with its legacy of slaveholding. Brown University has examined critically its early involvement in the slave trade. Both schools have devoted significant sums of money for increasing opportunities for students who were, in a manner, the descendants of those who suffered from these historic injustices. But university systems have done little to explore their historic connections to native peoples and obligations that come with teaching and learning on native ground. My campus in Geneseo, for instance, is located in the historic homeland of the Senecas. Before Geneseo was the county seat of Livingston County, Senecas from town of Chenussio played important roles in the history of this region and the three successive empires that vied for control of what became western New York: France, England, and the United States. New Yorkers coveted that land, and speculators swooped in after the Revolution. New York became the Empire State through a systematic program of Indian dispossession. Indian losses were New Yorkers’ gains. New Yorkers advocated the removal of the Iroquois decades before Andrew Jackson became President. New York’s Indian boarding school, the Thomas Asylum, lasted for a century into the 1950s, commencing before, and lasting long after these institutions had fallen out of favor. Disease, warfare, dispossession, coercive assimilation: New York’s native peoples have faced them all. The records of the state’s treaties and transactions are chock full of instances of deception and deceit, fraud and coercion. If you own a home in this state, you have benefited from the state’s concerted effort to dispossess its native peoples. And nearly every SUNY campus stands on what was once native ground, on land acquired by foul means. Providing the funding necessary for this will not be easy. Money always is in short supply. But it is simply a matter of choice, of deciding what matters. Syracuse University for more than a decade has covered all costs associated with attendance through its “Haudenosaunee Promise” program. Standing on ground that once was the geographic and cultural center of the Iroquois League, Syracuse decide d to recognize that past. SUNY could follow Syracuse’s lead. Excelsior, and the paltry funding provided for Native American students through scholarships overseen by the New York Department of Education, are not adequate. We should do more. If any number of state officials had their way during New York’s long history, the Iroquois and other New York Indians would have disappeared. They would have been driven out of the state to new homes in Canada, Wisconsin, Arkansas, or Oklahoma—anywhere but here. The people and their culture would have been eradicated, the language erased. Yet Native Americans in New York State, from Long Island to Niagara, and from the North Country to the Allegheny, have survived all that this state has thrown at them. They are still here, and the State’s debt is huge. It is time to pay it back. 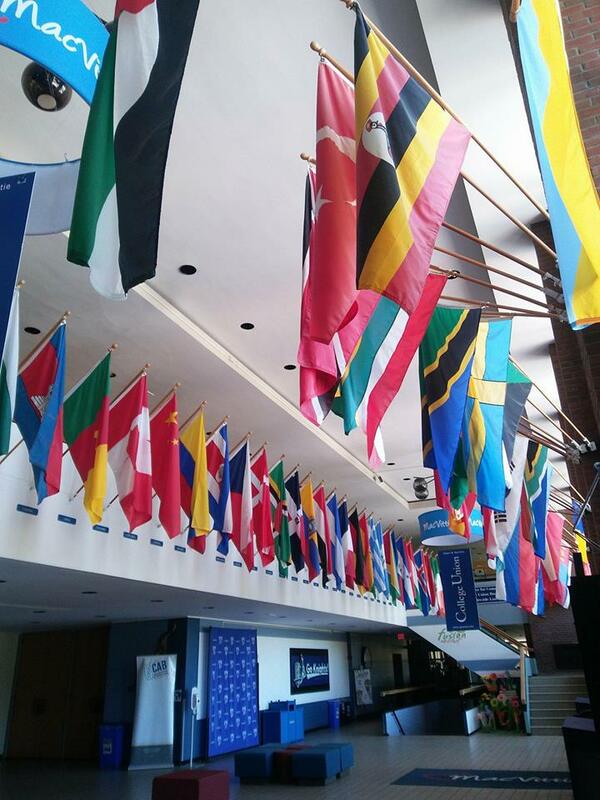 Geneseo has made some small, superficial changes. Last fall the College Senate approved a resolution recognizing Indigenous Peoples’ Day. The school is traditionally closed that day as part of what we call “Fall Break.” The college approved a new diversity statement recognizing that the college stands on lands in the historic homeland of the Seneca Nation and Tonawanda Seneca Indian Nation, though that statement has not yet been placed on the college’s website. 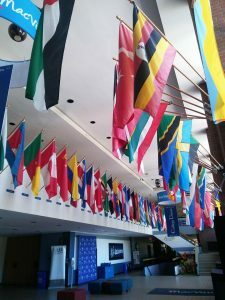 I am still waiting for staff to install the Haudenosaunee flag in the Student Union’s gallery of flags representing all our foreign students’ countries, despite receiving assurances that it will happen. 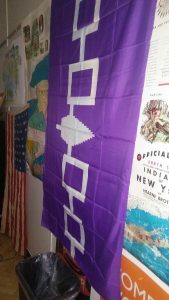 The Haudenosaunee Flag flies on campus ……only in my office. But all of this is easy. It costs my college absolutely nothing but the labor of a large number of committed faculty to write a new diversity statement, or to acknowledge Indigenous Peoples’ Day. 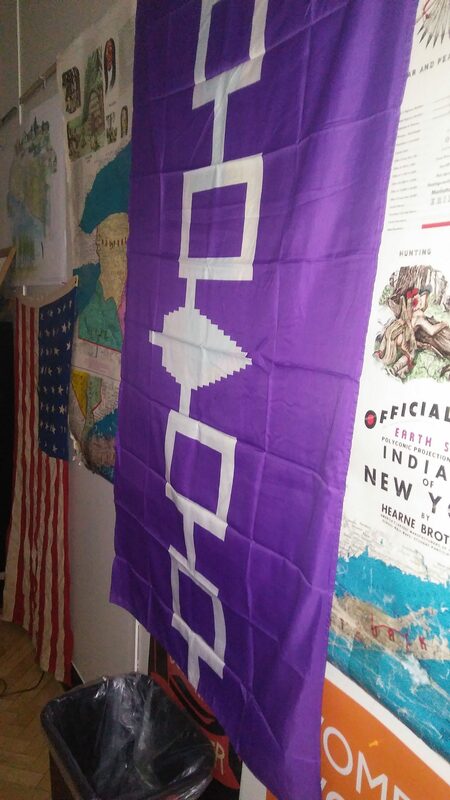 A Haudenosaunee flag can be purchased for a few bucks, so I am not sure what the delay is in putting it up, but still, chump change. Easy work. At the end of the week in which my editorial appeared, the college announced an opening in admissions for an international recruiter to lure foreign students to Geneseo. In the past days, I have seen announcements for two additional openings in admissions. None of the positions mention anything about outreach to the state’s small but significant Native American population. I have been quietly urging the college to hire a person to work on recruiting and retaining Native American students. So far nothing. Anyone who follows the news in higher education knows that money is tight. Wisconsin-Stevens Point is going crazy eliminating academic majors in the liberal arts. Catholic University of America is preparing a plan to lay-off tenure-track faculty. The University of Montana has appointed a clown with no experience in academia to begin deep cuts in programs and spending. SUNY has been chronically underfunded for years and my school’s leaders have done an enormous amount with very little for a long time. I understand that there is not enough money to do everything that every faculty member wants. But let’s not pretend that we do not have choices. For the money that the SUNY sytsem fritters away on Division I sports every Native American student who wanted to attend SUNY could do so. From my perspective, we are talking here about obligations, about acknowledging the history of the state, the town where my college is located, the native ground upon which it stands. At my college, as I have pointed out before, we wine and dine visiting dignitaries at the Big Tree Inn. Its named after the treaty negotiated in town in 1797 in which the Senecas lost all of their lands west of the Genesee River save for a number of reservations, only four of which remain. We have dining halls named after Red Jacket and Mary Jemison, important figures in Seneca history, and historical markers on and around campus point to the region’s history–as the Western Door of the Longhouse, as a zone invaded by Sullivan’s Continental soldiers waging a scorched earth campaign in 1779, and as lands coveted by speculators and settlers afterwards. We trade in this history at Geneseo. The town I teach in could not exist without a systematic program of Indian dispossession. It is easy to acknowledge that history. It is more difficult to do something to make an often uninterested community aware of historical obligations, that what they have is possible because of the losses suffered by native peoples. But it can be done. And it should. Important article, and very interesting. Great job. Thanks for reading, Dean. Hope you are well.